According to the article, effort is being made to make sure there is something “in it” for every area of the county to entice people to vote for it. A few specific ideas were mentioned, but the article sounds as though people in power are busily coming up with things to spend money they don’t even have yet. If this tax increase goes forward it is expected to generate $35 million a year. The tax would be in place for eight years, then renewable by voters every seven years. Seldom, however, does a tax ever go away once it is in place. Several comments quoted in the article alarm me. “It’s got to be something for everybody for it to have enough support,” County Councilman Jim Kinard of Swansea said. “We’ll get a piece of the pie,” Pine Ridge Mayor David Busby predicted. “Backers” say they need to keep up with the steady stream of people moving to Lexington County. In my opinion, an impact fee may be a more intelligent way to address that issue, instead of a tax increase. Earmark THAT money to help with the wanted infrastructure improvements and if there is any left, THEN add frills and ruffles. A few of the projects already mentioned are greenways in the Saluda River Area, paving dirt roads, a new interstate exit to the airport, new community centers, and ending flooding problems in some Irmo neighborhoods. Although no panel has yet been appointed to oversee requests, it is reported that communities are being asked to compile lists of projects they would like to see in their area. 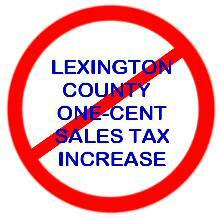 If it’s not already obvious, I’m personally against this potential tax increase. Certainly there are things the county needs but it’s time for government take a page from taxpayers’ books – if you don’t have it, don’t spend it. Quit digging deeper and deeper into everyone’s pockets. These days a lot of peoples first priority is how they are going to take care of their families, with prices rising and the economy so uncertain. Government needs to lose the spend, spend, spend attitude. This latest scheme makes me think of someone sitting back and dreaming of what they would do if they won the lottery, dreaming of buying things they could manage just fine without. Heck, I’d like to have a new car, but can’t afford one so I’ll make do with what I have. Politicians need to quit making so free with everybodys money. Think about it.